Mango is the King of all fruits . it is the awesome fruit available in hot summer. It is very helpful fruit as it has so many useful vitamins and proteins and all. fully ripen mangoes are rich in sugar , but green mangoes are rich in vitamin C and vitamin A which is helpful to eyes. If you sprinkle little salt on them they reduce uneasyness , if u eat every day onemango and then after a glass of milk it will increase weight also so it is very useful for thin people. add sugar to milk and boil them for 10 to 15 mins on slow flame . 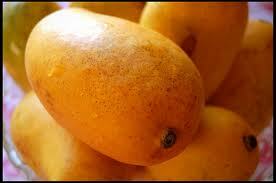 take ripen mangoes , wash them with fresh water then remove skin and take out all flesh keep in a bowl .